Located in Galesburg, Illinois, we have a large manufacturing/warehouse facility. All our wedge wire screens are manufactured in the flat by our select group of certified welders. Since very few wedge wire screening applications lend themselves to out-of-stock answers, each wedge wire screen application must be considered individually. That's where our 200 years of combined experience in wedge wire and screen design, application and manufacturing really comes to the forefront. 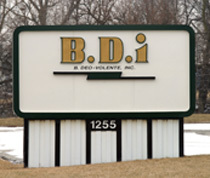 We at BDi will put our knowledge and experience to work for you to provide the best answers to all your industrial profile screening needs. Not exactly sure what you need? In-house experts are available to discuss specific requirements to ensure you select the right profile screen for your application. Our commitment to excellence and customer satisfaction has made us a leader in the wedge wire screen industry. We take pride in our work and are continually striving to provide the best quality product on the market.